This design started as an exercise in architectural visualization. It has become one of my pet projects that keeps getting refined. The keyboards and chair are from the free Viewpoint library. 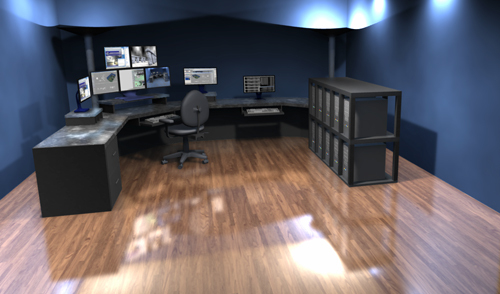 Everything else in the scene is modeled in Lightwave 3D's excellent polygonal modeler. The wood floor is an updated version of a texture I created originally in 1992. It is still one of the best dynamic wood textures I've seen.